These salmon appetizers, flavoured with dill and lemon, are sure to become a new entertaining favourite. 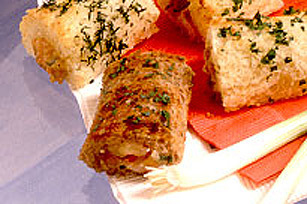 Serve them warm as a bite-size appetizer or a simple starter. TRIM crusts from bread. Flatten with rolling pin to 1/4 inch (0.5 cm) thickness. COMBINE salmon, Miracle Whip and dill and lemon juice. Place 1 heaping Tbsp (15 mL) filling along one end of bread. Roll up and cut in half. PLACE on ungreased baking sheet. Brush with butter; sprinkle with parsley. Bake at 350°F (180°C) for 15 minutes until golden. Serve warm.